Turning pumpkins into jack-o-lanterns is quite a transformation. This happens both by adding and by taking away. Learning is like this too. In order for pumpkins to shine as jack-o-lanterns something needs to happen. There needs to be some action. 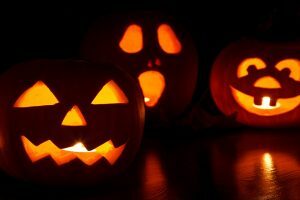 Carving a pumpkin gives it eyes for seeing, a nose for smelling, and a mouth for talking. In a way, learning for kids also requires action. Some of this learning comes from their own play and exploration. Some of it also comes from the action of parents, families, and caregivers. That is to say, from us. Every day we can facilitate kids’ interaction with the world. For example, in the morning when helping little ones get dressed, talk about the weather and choosing clothes for the day. Count the buttons on the shirt, name the colors, sing about getting ready, “This is the way we get dressed, we get dressed, we get dressed.” In order to connect with others, we use language. The words we use with and around a child are downloading language into that child’s brain. 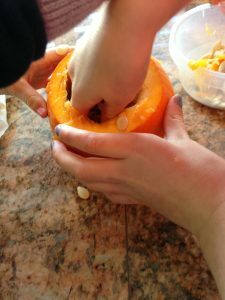 We add features to the jack-o-lantern and we add to a child’s day with our actions, big adventures and ordinary, everyday experiences. Carving the pumpkin leaves some empty spaces in the shell. For kids we need to make sure we leave space in the day for them to play. Days get so busy it seems like every moment is full, but kids need time to figure out the world in their own way. We might have to get creative in order to do this, like letting them have a drawer in the kitchen with things they can touch and use when we’re busy making a meal. Bring home a big cardboard box. It isn’t empty, it’s full of possibilities. We also put a candle or light inside. Now, the jack-o-lantern can shine. Turning pumpkins into jack-o-lanterns might be your activity for the day. Some people use turnips and recently, there have been photos and instructions for pineapple lanterns. Whatever we use, maybe our job as parents and caregivers is to put a light inside kids so they can shine too? 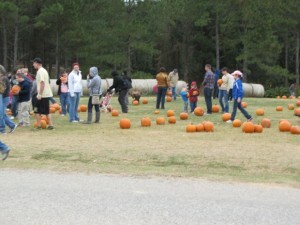 In between rainy days, we’ve squeezed in visiting the pumpkin patch and corn maze. What a special place for kids and grownups with lots to enjoy. 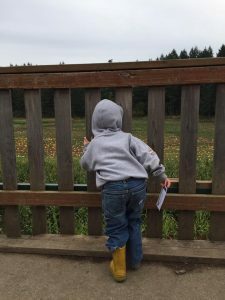 The pumpkin patch engages our senses. Visually, it’s bright with color. The autumn leaves dance with orange, gold, and sometimes red. The pumpkins glow against the backdrop of the dirt or straw. The green of the corn stalks is fading and turning to soft yellows. Crows are big and black against the sky. Both sunny or grey days have much to see. For the sense of touch, the pumpkins are heavy and mostly smooth. The stems are rough and bumpy. Our skin feels the cool touch of fall weather. The sound of voices and laughter fills the air. 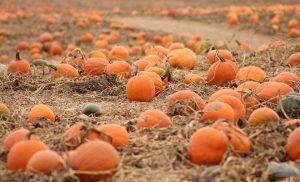 We can hear the crunch of leaves and straw underfoot and the grunts of kids carrying pumpkins as big as themselves. There’s an earthy smell tickling our noses. Our tongues anticipate the taste of hot chocolate and maybe some pumpkin treats and popcorn. So much information comes to us thru our senses. For children especially, much of their interaction with the world is on a sensory level. No wonder it’s fun. Not just bodies, brains participate at a heightened level too. Think of the special vocabulary as we talk about the patch: ripe, round, heavy, ridges, rows, small, giant, enormous, tiny, vines, bumpy, smooth, flat, stem, seeds, and more. If the pumpkin patch has a corn maze like the one in our area there are more words like stalks, corn silk, cobs, ears, and kernels. 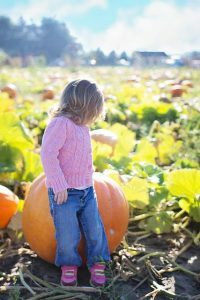 Picking out the right pumpkin takes thinking skills, such as comparing, problem-solving, and imagining. Choosing is an active process. How many and how big are math questions. Science is happening from the ground up and the connection to nature is all around. There’s no doubt visiting the pumpkin patch and corn maze is an adventure. For some families, it becomes an annual and much anticipated tradition. Could this be your family’s play-of-the-day? 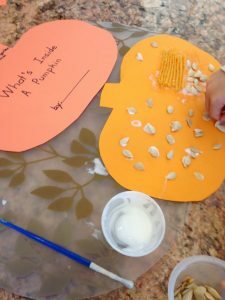 After scooping out a pumpkin, here is a way your child can show and tell about it with this What’s Inside Your Pumpkin activity. More fun but less gooey. It also makes a book your child can read, even if there aren’t any words. 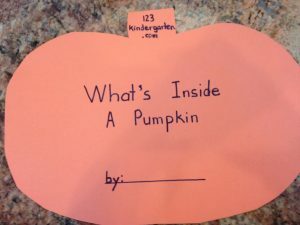 Before starting this activity, you and your child need to explore what’s inside a pumpkin. The best way to do this is by scooping one out. We did this earlier and left the seeds and fibers out overnight to make it easier to separate and give the seeds a little time to dry. You can also put the stuff in warm water and sort of wash out the seeds. Kids need to help scooping one out so they can experience for themselves what’s inside. 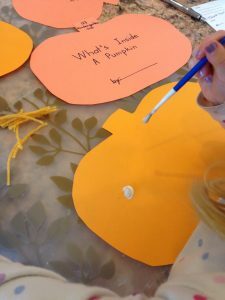 Besides some seeds and hands-on time in a pumpkin, this activity needs two pieces of thicker paper, one a pale orange or yellow color and one bright orange, lots of glue, and pieces of yellow or orange yarn. Big hands can cut the two pieces of paper into the shape of a pumpkin. Leave a bit of stem at the top to staple the pages together. Also, print the title on the orange paper, What’s Inside a Pumpkin? Some children might be able to copy a few of the letters or write their name on the page. 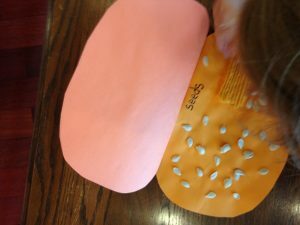 On the second sheet of paper, kids get to glue the pumpkin guts or brains. The yarn is like the fiber strands. The seeds are the real ones from scooping out the pumpkin. Gluing the yarn isn’t easy because it will sticky to fingers. Getting the seeds to stay on the paper needs quite a bit of glue. A paint brush is a great tool for this. Once the glue has dried, staple the two pages together. Now, kids can ‘read’ their book. They will know the title from memory. When they lift up that page and turn to the next, they can show and tell what they found. Contrary to what it looks like, reading doesn’t start with the words on a page. Reading starts with the words we already know and use, no matter what language we speak. Reading is based on meaning. 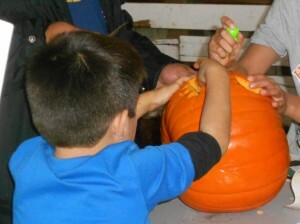 Having the experience of scooping out a pumpkin to see what’s inside gives kids a connection. They may not have a clue about the letters but they sure have the meaning. The yarn and the seeds are taking the place of the words and kids are reading them. You can write the word seeds beside the real ones to show kids the link between the funny squiggles and the real things. These two What’s Inside A Pumpkin pages are your child’s very own book. Wouldn’t you say now the effort to get the seeds from the pumpkin was worth it?